We often write about decals made out of vinyl for glass, walls, vehicles, weddings, dance floors and crafts but rarely do we have the opportunity to write about etched glass, a similar product to vinyl decals and a product that looks simply stunning when applied to glass. Well this past week, we had the opportunity to install some etched glass for Gardening by Design here in Ottawa, and it truly does jump out and make quite the impression. Etched glass material can be used to cut patterns, or business logo's and can be applied as a simple rectangle for privacy purposes to glass to create an etched look to existing glass, windows, wine glasses, mirrors and other flat glass related surfaces for a fraction of the cost of true etched glass and no need for sandblasting or etching creams. The following pictures are from our recent installation of etched glass vinyl, that we cut out our customers business logo and slogan for an overhead mezzanine glass railing. 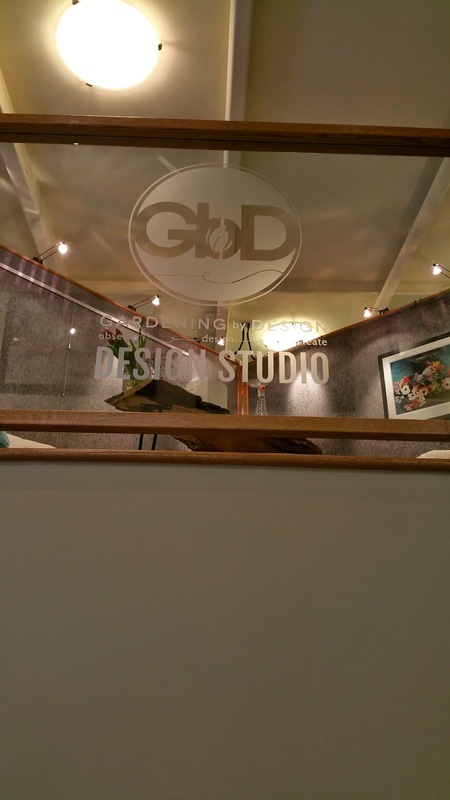 Once applied and installed the etched glass decal truly looked amazing, creating the look of etched glass. As you can see etched glass simply looks stunning and is a great subtle way to showcase your business logo to customers and can be installed economically in comparison to true sand blasting. Etched glass can also be removed just as easily as it is installed and can be applied to mirrors or glass ware and if you need privacy can be used to cover a whole window with or without your logo or information cut from the privacy rectangle. If you are interested in using etched glass in your business or home, we would be happy to discuss with you the endless possibilities and designs you may have in mind.